Yesterday I had a wander to my local Sue Ryder charity shop-it is the closest one to me, only ten minutes walk if that, but over the years I've found many a designer bargain in there-the main one being the Ossie Clark dress which is now sadly long gone. Anyhow, I found this Jean Paul Gaultier dress which has a wintry pattern to it and not much hanger appeal-but on and belted with some thermal tights underneath, will be perfect for this coming season. It originally had a drawstring waist, but the previous owner must have taken it out. I do have a few dresses, but mainly summer ones, so this one will be a welcome addition to my wardrobe, rather than a 'repeat' buy. It was £25.00, which is more than what I do generally pay, but when comparing what you spend in the high street it isn't at all, plus it is a nice amount going directly to my local charity shop, who I would be very sad to see go if rent increases mean they had to leave where they are now. What is your best thrift find so far? That's a stunner, I love JPG. My best ever charity find was probably my floor length black wool crepe Bill Gibb dress for £30, or a polka dot Jean Varon dirndl dress for £5 in the middle of nowhere in Devon. But both were a long time ago now, sadly! Well scored!Not something you find everyday! !That'll look fab on! Wow! Super! My best buy will have to be my jumbo Chanel 2.55 from the most beautiful store in Cannes run by two wonderful old women. I actually scored pretty well just the other day when I got a Rick Owens Dark Shadow top for £30. My best find ever has to be my Ann Demeulemeester leather jacket it was £200 so not cheap but it certainly had one less nought on the end than the retail price! I live in it, its one of my all time favourties! Awesome find! I wish I had a store like that! This dress is gorgeous, it will indeed be great for winter with some woolly tights and boots underneath. Worth every penny. My best find was probably a 70s Diane Von Furstenburg silk wrap dress for £25, which I have worn countless times for work and always get complimented on. This looks like it promises to be super comfy. My favourite find? Well there have been several - the most special one was a brand new (with original tag still attached to it) Hermes scarf. Whooza, what a great buy! I think my best buy was a pure silk coat-dress from the 80s (£12, also a bit more, but hey, the material itself would have been 4x the price). All I had to do was move the buttons a bit... I'm planning to post about it. What a great find, Sharon!! !I would love to stumble on a perfect winter piece like that and then find out that it was Gaultier. My best find was last December: a Bottega Veneta purse at Good Will (one of very few charity shops we have in the states). I got it for $1.80 (which is about a pound!). Another great find. Glad you saw the potential. One of my best eBay finds was a Donald Brooks Couture evening gown for $60. Well done all round - great buy for you, fabulous choice and you are right when it come to spending there rather than anywhere else. How great. I hope you get lots of enjoyment with it this winter. 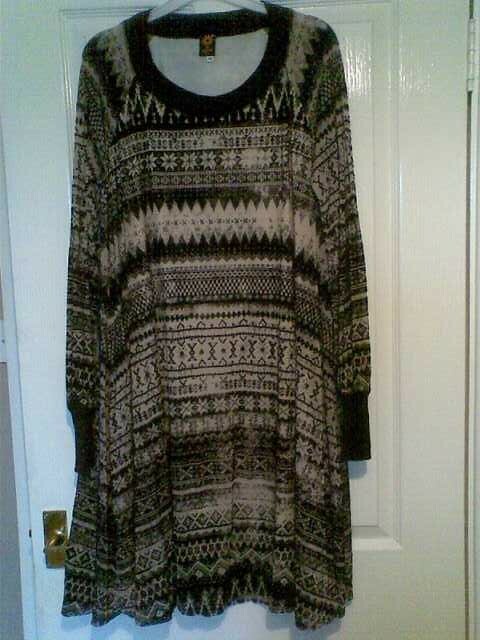 I found a Mulberry dress for £12 last year, that's probably my best ever find. Oh, I love it! So cute! Hi Sharon, you always manage to find the most awesome treasures. I love this outfit so pls be sure to do another post with the belt and tights added! I really loved 80s fashion. For me it represented a renewed excitement for fashion and music. Everything was bold and perhaps a little overdone (big hair, big shoulders!) but definitely exciting. Just wanted to post about my blog where I talk about my fashion finds at Goodwill! Super find.The print is wonderful. I just bought the most amazing Coach brand wool coat. It fits me like a glove and was only $15 at my favorite Goodwill store. Daaaaaaaaaaaamn girl, you are seriously the luckiest thrift store shopper like, ever! ^_^ That is one wonderful dress. I love the pattern! I've seen quite a few pieces similar in feel online, for loads of money. Yours is the best! Can't wait to see you wearing it! I just found some *beautiful* vintage coats (including a long, military-style suede one) at our local hospice thrift store today! That's my thrift bargain so far. I'll post pics a.s.a.p. Wow, what a great find! I aspire to be as good at thrifting as you!